A strong rich blend of best African and Assam teas. By appointment to HRH The Prince of Wales: Suppliers of beverages, Taylors of Harrogate North Yorkshire. Est. 1886. 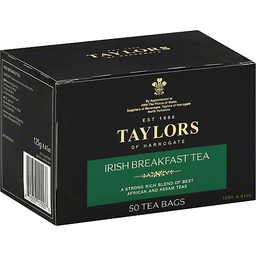 Our traditional Irish blend of top quality East African and Assam teas. It has a wonderfully robust flavour, strong and rich, with a bright rosy liquor in the cup. Our Irish Breakfast tea is an absolutely perfect way to greet the morning, while its reviving, full-bodied taste will also be welcome at any time of the day. Founded in 1886, we are an independent family business, dedicated to the pleasures of good tea and coffee. In every cup of our tea you can taste the skill, creativity and craftsmanship of our tea blenders. We visit tea estates personally to select only the finest seasonal hand-plucked teas. By investing in long-term partnerships and paying fair prices, we are able to make a positive difference to the quality of our teas and the lives of the growers. We are members of the Ethical Tea Partnership who work to ensure good living and working conditions for tea farmers, and we have planted over 3 million trees since 1990. www.taylorsofharrogate.com. www.brandsofbritain.com. Blended and packed in England by Taylors of Harrogate. A rich and refreshing blend of the world's best teas. By appointment to HRH The Prince of Wales: Suppliers of beverages, Taylors of Harrogate North Yorkshire. Est. 1886. Some of the world's best teas from India and Africa are combined to create our special version of this classic blend. The taste is full-bodied, rich and refreshing, with a bright, inviting colour, making it the ideal tea for enjoying not just at breakfast time, but also at any time of the day. Founded in 1886, we are an independent family business, dedicated to the pleasures of good tea and coffee. In every cup of our tea you can taste the skill, creativity and craftsmanship of our tea blenders. We visit tea estates personally to select only the finest seasonal hand-plucked teas. By investing in long-term partnerships and paying fair prices, we are able to make a positive difference tot he quality of our teas and the lives of the growers. We are members of the Ethical Tea Partnership who work to ensure good living and working conditions for tea farmers, and we have planted over 3 million trees since 1990. www.taylorsofharrogate.com. www.brandsofbritain.com. Blended and packed in England by Taylors of Harrogate. A uniquely smoky flavour characterises this oriental tea. By appointment to HRH The Prince of Wales Suppliers of Beverages, Taylors of Harrogate North Yorkshire. Est. 1886. A traditional oriental tea made by drying the tea over wood fires. 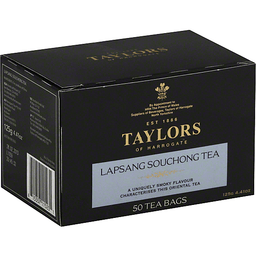 The unique, smoky flavour that this imparts to the tea makes Lapsang one of the world's classic teas. Founded in 1886, we are an independent family business, dedicated to the pleasures of good tea and coffee. In every cup of our tea you can taste the skill, creativity and craftsmanship of our tea blenders. We visit tea estates personally to select only the finest seasonal hand-plucked teas. By investing in long-term partnerships and paying fair prices, we are able to make a positive difference to the quality of our teas and the lives of the growers. We are members of the Ethical Tea Partnership who work to ensure good living and working conditions for tea farmers, and we have planted over 3 million trees since 1990. Blended and packed in England by Taylors of Harrogate, HG2 7LD. Produce of China.